A domestic dispute between two couples and a relative ended with an accidental discharging of a firearm within city limits. Police officers were dispatched to a call that someone had discharged a firearm within city limits and discovered a car speeding away from the scene. After pulling over the vehicle, officers discovered a car overloaded with people, two of which were injured. One was suffering from a head injury while another had a gunshot wound to the foot. Returning to the area in which the firearm had been discharged, officers were able to determine the individual’s head injury and the other person’s bullet hole in his foot to have been the result of a domestic dispute that had become violent. The shooting was accidental, yet the man with the weapon will likely face charges for assault for pistol-whipping the individual with a head injury, brandishing a weapon in a threatening manner, and discharging a firearm within city limits. (vii) Without written permission to discharge the dangerous weapon from the owner or person in charge of the property within 600 feet of . . . a house . . . or any structure in which a domestic animal is kept or fed”. There are some occurrences when discharging a firearm within city limits would not result in criminal charges. 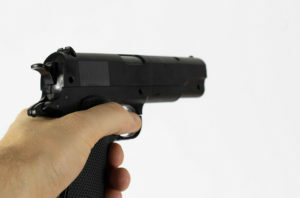 Some such instances include self-defense cases when a person is found to be justified in using a weapon to protect themselves. Additionally, while state and many city laws prohibit firearm use near a residence, Utah homeowners are allowed to defend their home from dangerous intruders. 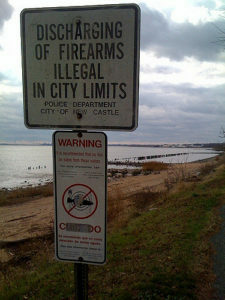 This freedom to protect a home and its residents is known as Castle Doctrine. Besides in instances of self-defense or Castle Doctrine, all Utah residents should be aware that brandishing a weapon during an altercation or discharging a firearm in city limits will likely be frowned upon by law enforcement. Others who may want to engage in innocent target shooting or “air-soft wars” may want to check with their local area ordinances prior to engaging in any such activity that could result in criminal charges.